A CCTV image has been released showing a man in a supermarket just hours before his body was found in a country park. Sam Mechelewski, 20, from Huntingdon, was found dead in Hinchingbrooke Country Park in the town on 1 February. 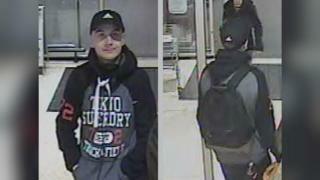 He was pictured in Sainsbury's in St Germain Walk, Huntingdon, shortly before 20:00 GMT on 31 January. A man arrested on suspicion of his murder has been released under investigation. Cambridgeshire Police have not yet said how Mr Mechelewski died, but officers believe he was killed in a "targeted attack". His body was found by a member of the public at about 13:00 in a wooded area of the park. Image caption Cambridgeshire Police said it believed Sam Mechelewski was killed in a "targeted attack"
"A week after the discovery of Sam's body, we are again appealing to anyone with information to contact us as a matter of urgency," Det Ch Insp Adam Gallop said. "If you recognise Sam from the CCTV image and saw him on the evening of 31 January please get in touch." Mr Mechelewski's family said: "The killing of our son at 20 years of age, when he had his whole life ahead of him, is devastating." Police arrested two people on suspicion of murdering Mr Mechelewski. A man in his 20s from Chatteris has been released under investigation. A man from Brampton, also in his 20s, was released with no further action being taken against him.